Getting a green card is tougher than before for immigrants these days. During a rally on Feb. 25, over 500 people gathered at Bellevue’s Downtown Park to show support for high-skilled Indian immigrants who are stuck in the green card backlog. GreenCard Reforms, or GC Reforms, organized the rally. It is a national organization started in 2017 by the Indian diaspora to actively work on the backlog issue for 300,000 primary applicants, H4 Kids and H4 EAD. Green card backlog has great impacts on immigrants who work as physicians, engineers, teachers, nurses and medical professionals. Since 1990, the H-1B program allows U.S. employers to hire highly skilled foreign workers for three years, so long as they have applied for green cards and renew their visas indefinitely. However, the per-country limit for immigrants to receive green cards is capped at seven percent, and people who are in this situation may need to go back to their home country to renew their H-1B visa, which is an inconvenience for foreign employees. Many prominent leaders spoke at the event, including the 9th District’s Rep. Adam Smith, state Sen. Manka Dhingra, former Bellevue Mayor and King County council member Claudia Balducci and Bellevue council member Conrad Lee. 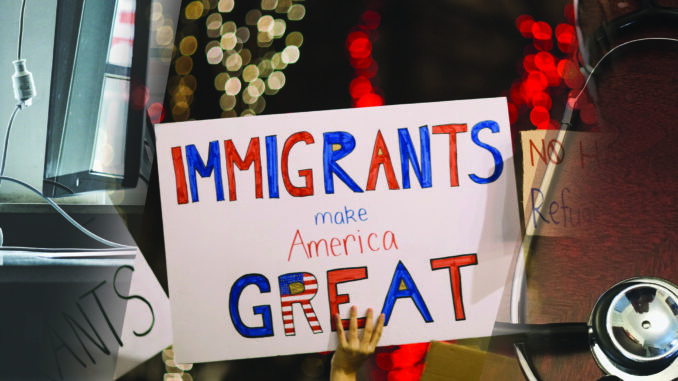 GC Reforms board members Kiran Kumar Thota and Sudip Gorakshakar have conveyed that the green card backlog needs addressing urgently for the high-skilled STEM graduates of Indian people to push the United State’s economic growth.